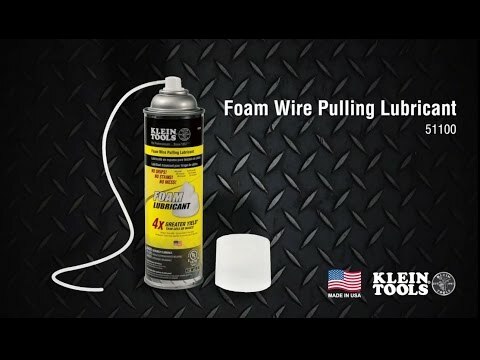 Klein Tools' Foam Wire Pulling Lubricant is a no mess, no hassle alternative to traditional wax/gel lubricants. The foam fills the conduit and coats the wires as they are pulled through. The lubricant stays where it is applied, even in vertical conduit. It also dissolves clean from hands, clothing and carpeting. Contents under pressure. Do not expose container to direct sunlight or temperatures above 120°F. Do not transport or store near heat sources. Keep cans dry and away from sources of ignition. If frozen, gradually warm to room temperature. Do not use wet product on live circuits. Compound is electrically conductive before it dries. For industrial and commercial use only.